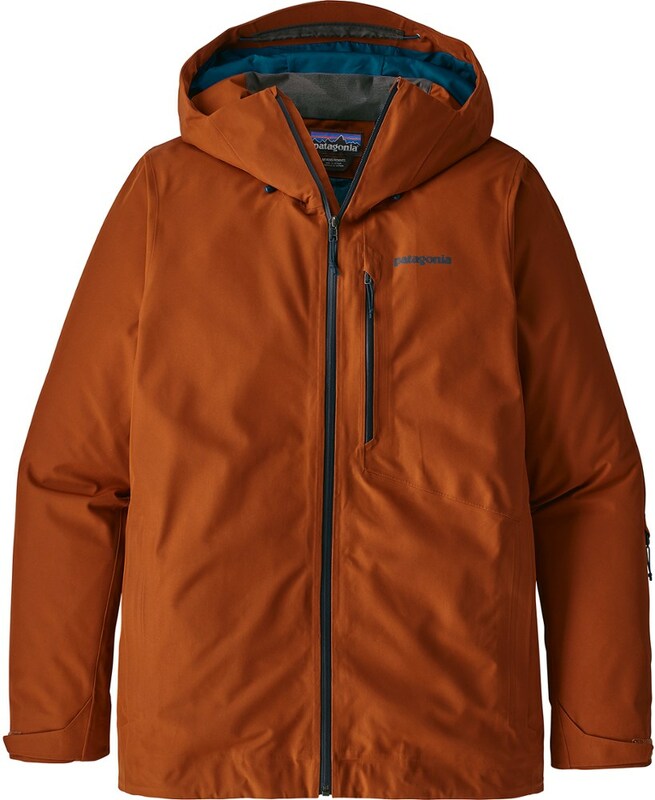 The Skyward Jacket by Outdoor Research is a hardshell jacket that is as flexible and comfortable as a softshell layer and is also waterproof! Designed for winter conditions, the Skyward is an excellent companion wherever the snow may take you. It’s heavier than other hardshell jackets on the market and keeps me warm and toasty even in sub-zero temperatures. However, these features may not be ideal for ultralighters or those who live in mild winter climates. 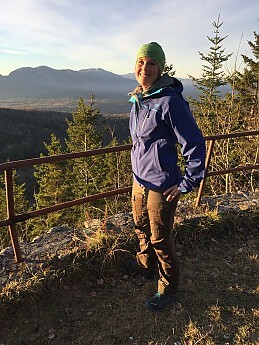 I tested the women’s Skyward Jacket as a member of the Trailspace Review Corps from early November 2016 through January of 2017. 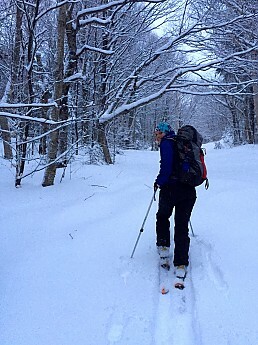 I wore the Skyward hiking, snowshoeing, fat-tire mountain biking, backcountry alpine ski touring, backcountry nordic skiing, and alpine skiing in and around New Hampshire’s White Mountains. Temperatures during this time ranged from 40 to -15 degrees Fahrenheit. I’m 5'4" with a short, fairly narrow torso (35" hip, 27" waist, 33" chest, 15.5" torso length) and the size small fits me perfectly. I have enough space for layering yet the jacket is fitted enough to prevent gapping. The arms are too long for me, but I appreciate the extra length as I can extend my arms fully (when poling, etc.) without risk of exposing my wrist to the elements. 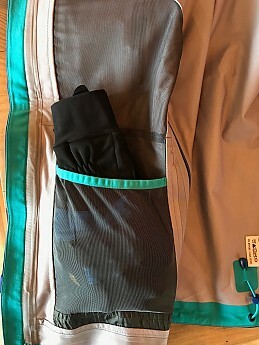 The unique AscentShell 3L fabric is composed of 84% nylon and 16% spandex, coming together to form a hardshell jacket that is both waterproof and flexible. 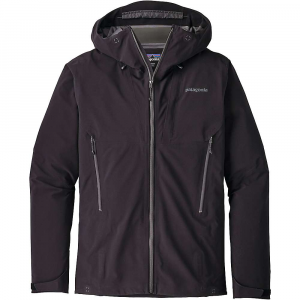 The Skyward certainly has more give than other hardshell jackets I've worn, but is less flexible than a softshell layer. 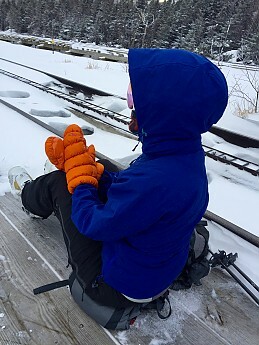 I’ve experienced no restriction in movement and have consistently felt comfortable wearing the Skyward, whether I’m skiing, snowshoeing, hiking, or just running errands around town. 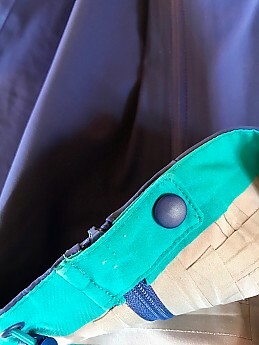 The cuffs of the jacket incorporate Velcro straps for easy manual adjustment. Because the length of the sleeves are longer than my arms, this feature prevents the cuffs from sliding down past my wrists. Elastic bands are sewn into a portion of each cuff, which allows for a secure fit around gloves and mittens of varying sizes and prevents air and snow from seeping in. Arm length of jacket with arm fully extended (above). Adjusted cuff (below). Elastic cord is incorporated into the hem at the hip and can be cinched to prevent snow, rain, or cold air from seeping in. The hood is helmet compatible and can be easily adjusted with elastic cords on either side of the hood and at the back to prevent gapping. The hood is wire-brimmed. This feature allows me to customize the shape of the brim for optimal visibility and protection from wind, rain, and snow. 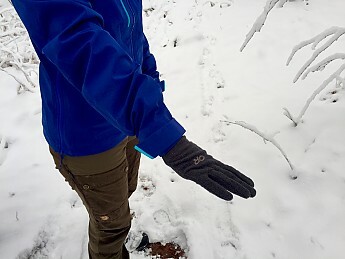 When I first received the Skyward, I was impressed by the softness and stretch of the shell, but was skeptical as to how effectively it would repel moisture. I’ve been pleasantly surprised to confirm that the Skyward is waterproof. 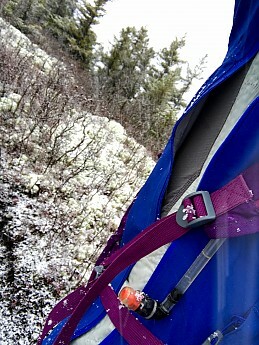 It sheds snow and rain, keeping me warm and dry during my backcountry and frontcountry excursions. While I’ve worn the Skyward on rainy days around town, I feel it would be overkill to use it as a rain jacket during high exertion activities. Something thinner and lighter weight is likely to be a better fit to avoid overheating in temperatures when precipitation comes in the form of rain rather than snow. I don’t see this as a negative—the jacket is designed for skiing after all—more just food for thought. 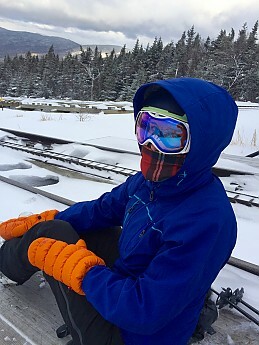 Breathability is a key factor in New England winter conditions. I need a hardshell layer that will keep the snow and wind out while offering the ventilation necessary to prevent moisture from building up inside. 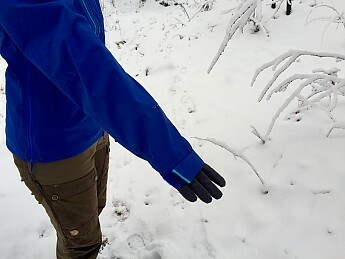 In my opinion, there’s nothing worse than arriving at the summit of a hike or ski tour with baselayers that are damp with sweat—a recipe for a cold transition and descent that can ruin an otherwise spectacular outdoor adventure. The Skyward offers excellent ventilation through 4 front pockets and 2 underarm vents. The underarm vents can be unzipped from the top or the bottom and run from the base of the hip to midway between my shoulder and elbow. 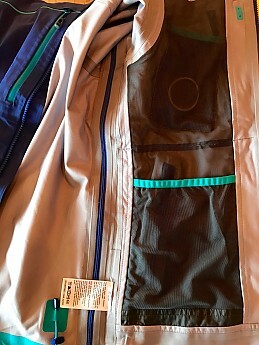 I have another OR shell that incorporated this feature (women’s Aspire Jacket). 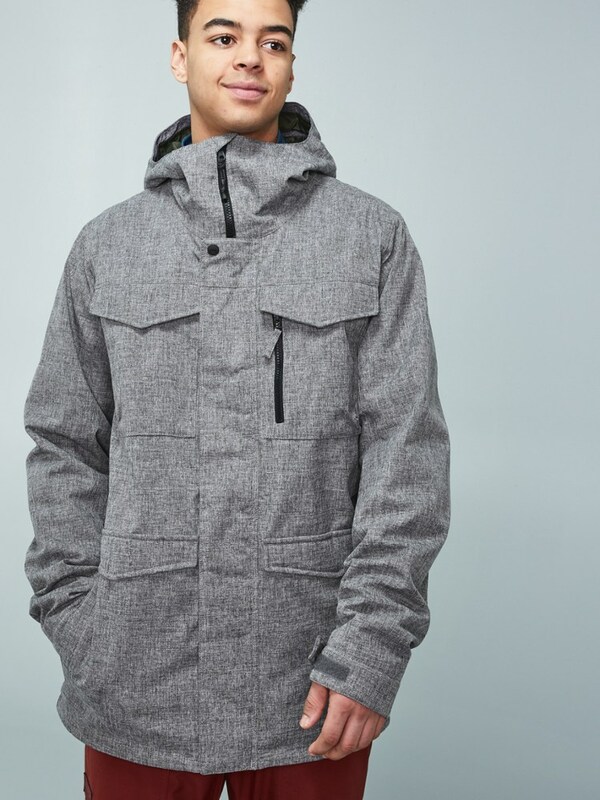 The breathability was excellent, but when the vent was completely unzipped the jacket felt more like a poncho and was prone to allowing moisture to get in through the opening. 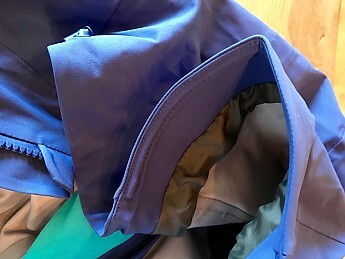 The Skyward has remedied this issue by installing a snap at the hip opening so that even when the vent is fully unzipped the jacket maintains its shape at the hem. Granted, it can feel a bit billowy when the vents are fully unzipped, which is something to pay attention to if it’s snowing or raining. I find that when wearing a pack this is less of an issue as the straps keep the jacket from puffing out too much. The Skyward is one of the beefier hard shell jackets I’ve worn. I mean this in the best possible way; I’ve never before worn a shell that felt as insulating and protecting from wind and snow. With the hood up and cords tightened down, not even the wind on the side of Mt. Washington could get through! Living in northern New England where winter temperatures regularly extend far below freezing, warmth is my top priority during winter excursions. However, the Skyward may be overkill for those living in milder climates. The downside, however, is the weight. Advertised as weighing 23 ounces, the Skyward weighs more than Outdoor Research’s other waterproof shells. The Aspire, for example, which I previously mentioned in this review, is reported to weigh just 13.7 ounces. (Others include the Clairvoyant at 12.1 ounces and the Revelation at 16.3 ounces.) 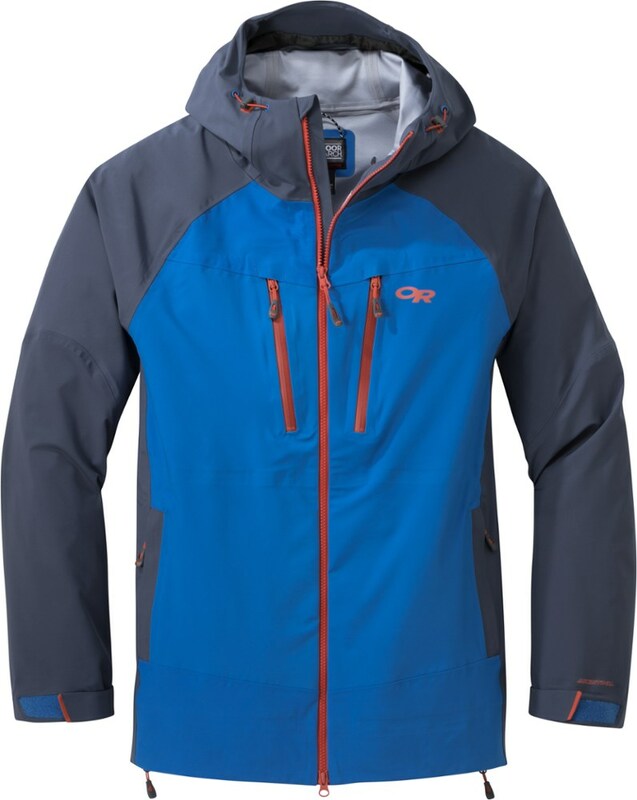 Ultralighters, this is likely not the jacket for you. 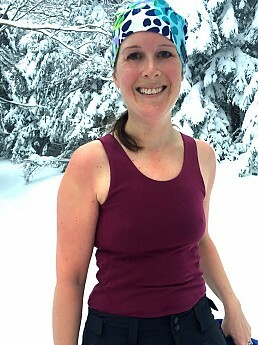 I often wore the Skyward over a merino or moisture-wicking tank top, a merino long-sleeve baselayer, and OR’s Deviator Hoody (can you tell I’m a fan of the brand??). 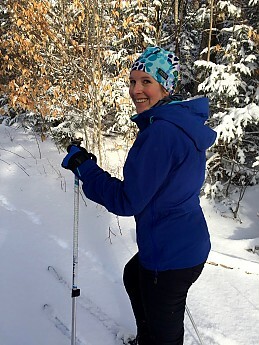 This was my go-to layering system for pretty much any backcountry activity—alpine or nordic skiing, mountain biking, hiking, or snowshoeing. The arm vents were features I’d frequently use once I got moving and my body temperature began to heat up. Wearing the Skyward with this layer system, I found I’d often stop to remove a layer at some point during an ascent (either remove the Skyward if it wasn’t precipitating, or shed a baselayer or two). This is pretty typical for me given the climate I live in and the winter activities I prefer. I added a down vest if temperatures were especially cold (single digits or lower), or if I was doing something slightly less exerting such as alpine skiing or the descent of a backcountry ski tour. Overall I haven’t noticed any issues with abrasion. The only “hot spot” I’ve noticed is at the brim of the hood. The adjustable wire has somehow snapped in two and the point where this has occurred is putting some strain on the surrounding material. 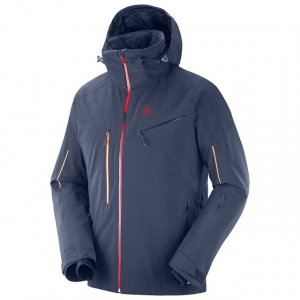 Fortunately Outdoor Research has an infinite guarantee, which means that if such a problem were to happen to you, the jacket could be replaced free of cost. I love this about OR. It certainly makes me feel more willing to make an investment in a product when I know the company will stand behind the gear it sells. Pockets: The Skyward has no shortage of pockets! 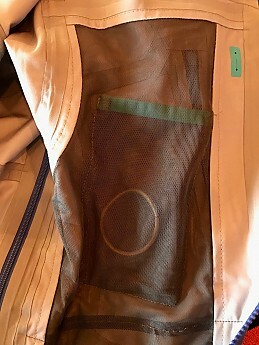 There are two internal mesh pockets that can easily store large items such as gloves. There are also four external pockets, two at the hip and two at the chest. Each are large enough to fit any item I typically store in a jacket pocket—keys, my phone, a trail map, etc. One chest pocket includes a pouch in which a phone could be stored securely. It’s a nice feature to have, but I haven’t found myself using it a lot as the zipper closure prevents items from falling out of any of the outer pockets, and having my phone slide around in my pocket every now and then isn’t something that bothers me. 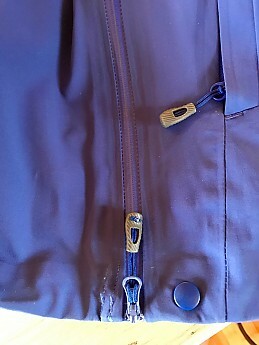 Zippers: As I mentioned, each of the four outer pockets zip closed. The Aquaguard zippers prevent moisture from seeping in. I really appreciate the "garages" that overhang the top closure of each of the chest pockets. Usually I find these sorts of features difficult to use. 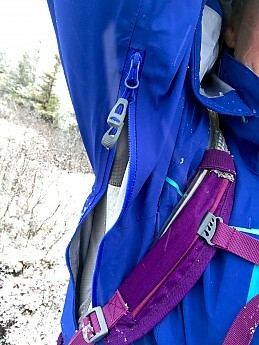 It can be such a small space to wedge the zipper into that I don’t bother with it when I’m out on the trail. However, zipper garages on the Skyward provide a larger space making it consistently easy to secure the zipper closure. Fabric overhangs both hip pockets, preventing moisture from resting against the zipper. 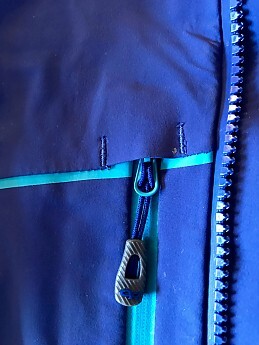 The main zipper is fully lined, preventing it from catching on skin or baselayers. I found the features of the Skyward jacket easy to use. Zippers zipped and unzipped without catching. Elastic cord and Velcro cinched efficiently and stayed in place. Pockets and vents were easy to access. I appreciated having the two chest pockets in addition to the hip pockets as they provided options for storing gear. This was especially helpful when I was wearing a pack. Due to my relatively short torso size, the waist belt of my pack tends to overlap at least a portion of the hip pockets of a jacket. When this was the case it was nice to have the option of using the chest pockets instead. 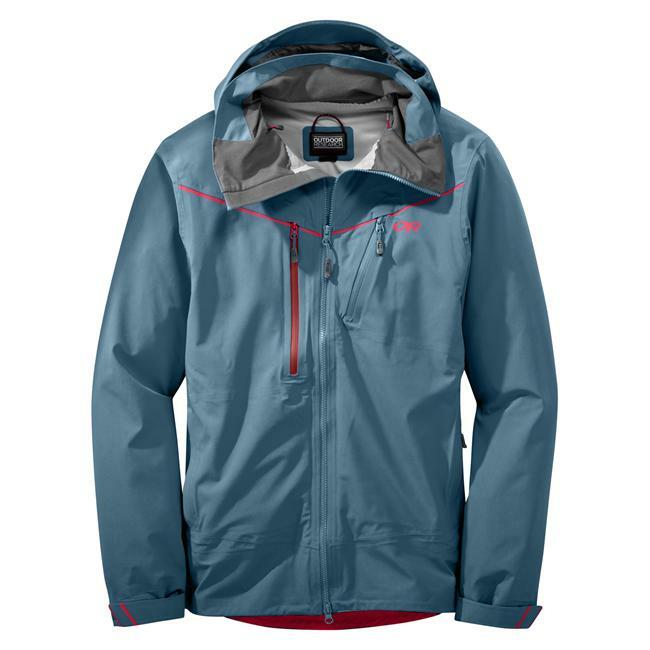 The AscentShell fabric is a feature that sets the Skyward apart from other hardshell jackets. 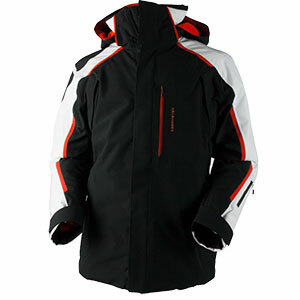 It incorporates that comfort and elasticity of a softshell jacket with the waterproofing and windproofing of a hardshell. While other hardshell jackets include stretch panels for east of movement, they sacrifice waterproofing. Being both waterproof and flexible, the Skyward really does allow you to have your cake and eat it too. The AscentShell is also advertised as highly breathable fabric to allow superior moisture wicking while not sacrificing waterproofing. The challenge here is that in order to appreciate the moisture wicking qualities of an outer layer, the inner layers must have the same feature. So, something to keep in mind. 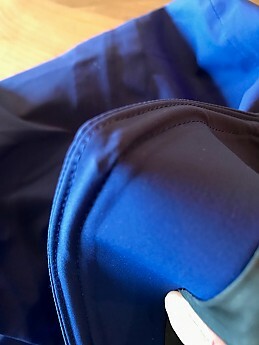 This moisture wicking feature in a hardshell jacket is something I was so excited about that I really wanted to notice a significant difference. 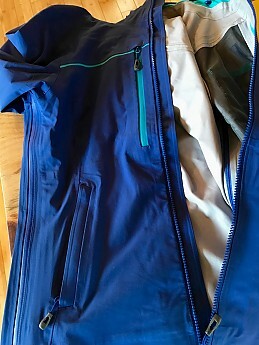 Initially, the Skyward felt just as breathable to me as other hardshell jackets, just not more so. 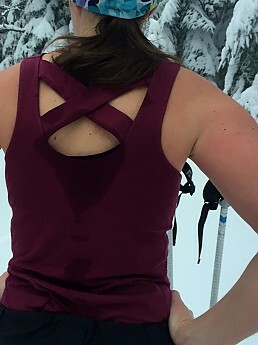 However, during the ascent of a backcountry ski excursion I decided to keep the Skyward on for the whole trip rather than peeling it off once I began to heat up. It was snowing hard and it was the only waterproof layer I had with me. So, I removed all of my base layers aside from a merino tank top and put the Skyward on over just this one layer. The temperature was right around 25 degrees and, with the pit zips unzipped just a little, I was comfortable throughout the remainder of the slog in to the turnaround point. In the below images, you can see that I was surprisingly un-sweaty when I reached the end of the ascent. The only area where moisture had built up was on the part of my back that was under my pack. So, my conclusion is that when it comes to moisture wicking, the AscentShell does its best work when paired with very few base layers. The Skyward certainly seems well constructed and durable. The zippers, AscentShell material, drawcords, etc. have stood up to some heavy wear over the past two months across a variety of outdoor activities and have consistently performed well. The only sign of wear is the fact that the wire in the hood broke in two. I’m not sure when or how it happened. The wire itself feels fairly durable, which leads me to believe there may have been a defect specific to the particular piece of wire that was used in this jacket. If anyone else has had this issue (with the Skyward or any other jackets with this feature) I’d be interested to hear from you as I’ve never experienced this problem before. The Skyward brings a new layer of security to my outdoor adventuring. I feel protected from snow and moisture while able to dump heat through underarm and pocket vents. Whether mountain biking, skiing, hiking, or snowshoeing, the Skyward allows for unrestricted movement without gapping. Living in New England where winters temperatures are generally below freezing, it’s the perfect outer layer for me. 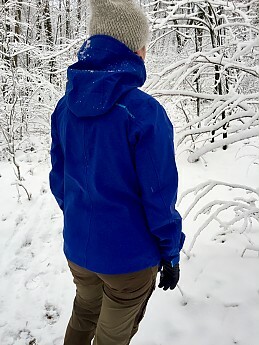 However, those who prefer ultralight gear or live in more mild winter climates might prefer a more lightweight hardshell. The arms are long, making the Skyward ideal for those with long limbs. While the cuffs can be adjusted, those with a more petite frame may be bothered by the arm length. Also, while the malfunction of the wire-brimmed hood may be an anomaly, it may be something to pay attention to, just to be sure this is not a more common problem. 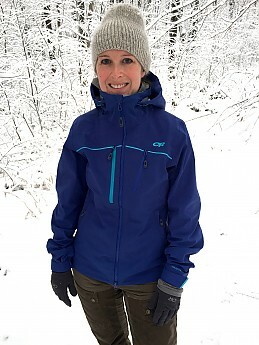 Personally, I like the jacket it so much that I actually purchased the Skyward Pants and have been wearing these two outer layers together when skiing in the backcountry or at the resort. 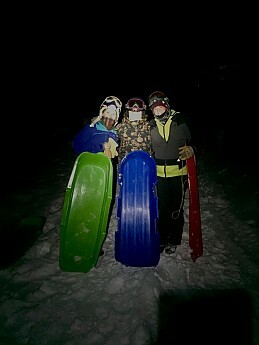 ...Oh yeah, and I even wore it sledding! Thanks to the folks at Outdoor Research and Trailspace for the opportunity to test out the Skyward! Another great review! Thanks, Kelly. Looks like a decent jacket. I have to ask though, is fat-tire mtn biking worth it? Fat biking is AMAZING!!!! This is my first year and it's been super fun as long as the conditions are right. Great review, Kelly! I'm glad to see you've been able to do so much outdoors this winter. 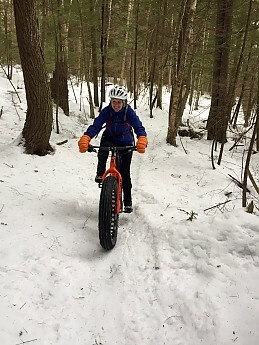 As for fat biking, I have quite a growing number of friends who all LOVE it. Apparently this is a great winter for it here in New England. I'd like to try it, but can't justify the cost and time of more winter gear.